When booking the wedding ceremony in Bali you may have a number of questions: what are my further steps, what questions to ask, how to pay the deposit, when and were will we meet to discuss the details, what are my guarantees, how soon will I get my pictures and so on. So we prepared this page for you to answer many of your questions. Step-by-step booking of the wedding ceremony. Step 1. Selecting the package and add-ons. Visiting our web-site you choose the wedding package that you are interested in and add-ons those you would like to have. It should be mentioned that the prices of our web-site are final and no organizer`s fee or other taxes will be added. It means that you can calculate to the penny the budget of your ceremony directly on web-site. Step 2. Advice and answers to your questions. If you have any questions while selecting - no need to wait for a long time: send us an e-mail and we will surely reply in a few hours. If you want to talk, our client managers will call to your cell phone or skype. If you are busy or have not so much time, you will surely get answers on all your questions during our meeting in Bali. Step 3. Concluding the contract. Once you have chosen all the components of your wedding ceremony, the official contract between you and our company will be send to you. The wedding contract is a document that includes: full name of the person, whom the contract is concluded with, total amount, deposit amount, payment methods, our details and other information. The integral part of the wedding contract is the Attachment that specifies in details the services and add-ons included in the contract price. Step 4. Booking the ceremony date and payment of the deposit. To book the desired date of the ceremony, you will need to pay the deposit (20-50% of the total contract amount. Exact deposit amount depends on the type of wedding ceremony. Usually, events in hotels, villas and yachts are required of 50% deposit) and send us the payment document (screen shot of the internet-banking, scan copy of the receipt or picture of the receipt made using the cell phone) to e-mail [email protected]. Different forms of payment are available for you: bank account, Western Union or even on-line cards Visa/MasterCard. See the detailed payment methods available on page Payment methods. Your wedding is considered to be booked only after we receive the deposit that our manger will inform you about. Step 5. Appointment of the pre-wedding meeting at our office. We meet at the comfortable office and not somewhere in café or hotel's lobbies. Our office is located in the heart of tourist area of the island. Our location allows you to get it in 20 minutes from each area, where the newlyweds usually stay. During the meeting we will discuss the details of the upcoming wedding ceremony. You can choose add-ons, colour spectrum, bride's bouquet or change the existing items. Specially prepared photo-video presentation on a wide screen will give you more clear and colourful idea about this gentle event. You will personally meet the team of organisers, pay rest of money by terminal and also you will get answers on all your questions about our island and your holiday here. We strongly recommend you to agree the exact time of the meeting via e-mail while you are at home. If you forget to do it, you shall surely call us or send sms first day (!!) of your staying at the island to the phone +628 777 999 77 25 (if you have no local service plan, which, by the way, will be provided to you during the meeting for free). Address of our office: Complex Kuta Central Park, Block PM1 №1 (Jl. Patih Jelantik, Kuta, Bali, Indonesia, 80361). Full address: Complex Kuta Central Park, Block PM1 №1 Jl. Patih Jelantik, Kuta, Bali, Indonesia, 80361. Tell the taxi driver a landmark "Kuta Central Park Hotel" - we are just in front of the lobby of this hotel. Once you cross the threshold of our office, you are in safe hands of the best wedding professionals of the island and feel the real care: since the meeting and till your departure you will be accompanied by the your personal manager! Why shall we order the wedding ceremony from you, what are your advantages? Convince us. We will try to convince you with facts, not with felicity phrases. Each our advantage you can easily check, not leaving our web-site. Consumer trust- see for yourself. We are proud that so many newly married couples are confident with us - see our portfolio. Nobody else has ever done something like that. Often we have over 40 weddings a month - but it shouldn't confuse you - we have enough employees in our team to pay maximum attention to each couple. The work of our team is shown in this short video at Youtube or this page. Also you can see real reviews from our authorized clients in the Reviews section (currently in russian) and even you can directly communicate with them. Superior quality. Organizing wedding ceremonies almost every day, our front-team is fully focused on details of event: as this is the most important for our clients. Surely, we have several directions, but the wedding team (and it’s more than 30 employees) works only in the wedding department creating exclusively quality ceremonies for you. We guaranty quality and expertise on our part. We sincerely appreciate both you and each client! Best prices! We are not an agent, but Bali-based wedding planner. Our team of employees includes florists, make-up artists, photographers, and even your wedding butler. We have lots and lots of our own wedding decorations. All of this allows us to offer you the best price-to-quality ratio. Availability and responsiveness. We are on-line over the phone and e-mail. Send us a letter or request a call back and we will talk already in a few hours at most. On-site payments. Having ordered a ceremony on our site, you can pay for it using different methods, including your Visa or MasterCard card. Legality and transparency. 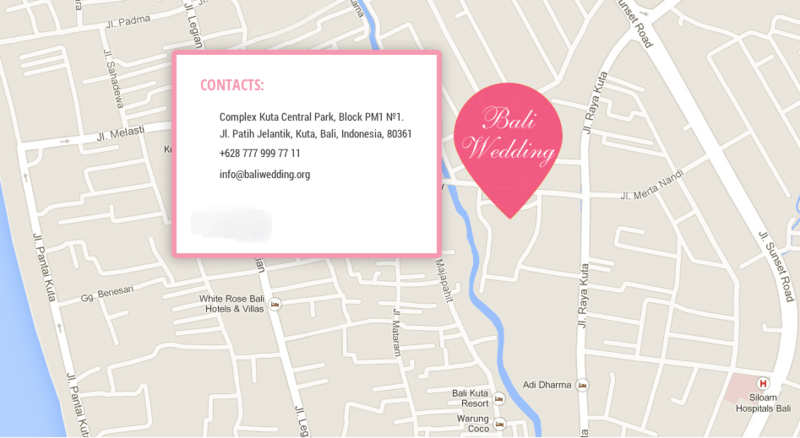 Baliwedding.org is a direction of Indonesian company The Seven Group, and we are the first, who work in the wedding market since 2008. Your pre-wedding meeting will take place in our office and you will be provided with official documents and cheques for payment of your wedding ceremony. Our company is a member of all Indonesian wedding and travel associations such as ASITA or Bali Wedding Association. Choosing us you are protected by the laws of the Republic of Indonesia. All our trade marks are registered. When and how will I get my wedding pictures and video? All file will include 40 processed pictures (note: light processing) and about 300-500 pictures made by the photographer totally. The exact number of the pictures depends on the type of the ceremony. All pictures are of high resolution (quality) and can be printed even for a bill-board! Download link is completely private: only people (we and you), who have it, can download your pictures. Example download link: go to this page. Can you tell us what time of the day the wedding ceremony is usually held in Bali? First of all it depends on your wedding ceremony. For example, if you choose the beach ceremony, your manager will surely contact you 24 hours before the ceremony and tell the time of the make-up beginning (by the way you will be provided with the approximate schedule of your ceremony from A to Z at the pre-wedding meeting). This is due to the fact that Bali Island is washed by Indian Ocean with the rise and fall of the tides. Sometimes, by high rise of the tides, some our beaches are completely covered with water. While by low fall of the tides, you will see the bare reefs and algae instead of the ocean on you pictures. When do we need to pay rest of money under the contract? How can we do it? 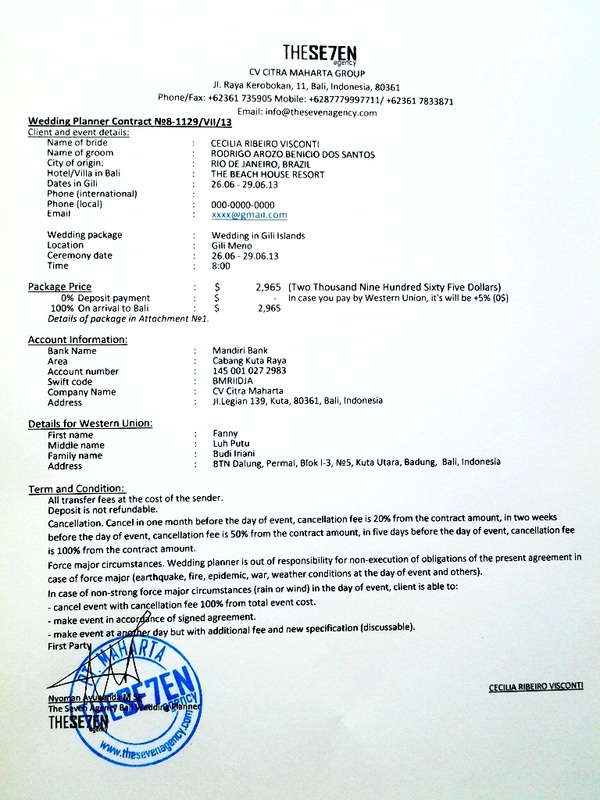 You will need to pay the rest of money under the contract at the pre-wedding meeting in Bali. You can pay cash or Visa/Mastercard card by terminal in our office. We don't want to pay deposit - can we pay the whole amount being yet in Bali? Yes, you can do it so, but there will be quite high risk that we won't be able to book your ceremony - all dates and places will be booked. The booking of your wedding ceremony is guaranteed exactly by e-mail correspondence and payment of the deposit from your country. Can we change the type of the ceremony selected in advance yet at the meeting with the organiser? Yes, it is possible, if there is a free another venue on your date. Still it is desirable to determine the type of wedding ceremony and its venue at the stage of the contract preparation. If we order beach or cliff ceremony, what hotel shall we better stay in to get to the venue? If you spend your holiday in the South part of the island (tourist areas: Nusa Dua, Seminyak, Kuta, Jimbaran, Canggu, Kerobokan, and Ubud) our wedding venues are not far from it, up to one hour. If you stay in far areas (for example, such as Lovina or Candidasa), the way to your wedding will take about two hours, although, it's not critical either (in this case there will be some additional payment for transfer). So if you decided to stay in the East or North area of Bali, we would advise you to change the hotel to more "Southern" to get to the ceremony venue easier. Also a great option in this case will the wedding night in the tropic bungalow presented as additional component of our wedding packages. How private will be our wedding ceremony? Although, we organise part of the ceremony in public venues, we guaranty you enough privacy. The area of your wedding ceremony venue will be free of unknown persons, except people engaged in organisation of your event. It has no respect to some venues for photosessions, those are included in many our packages. Can I have trial make-up and styling? Sure, you can. For additional payment (USD 95) our make-up artist will come to your hotel or villa with all the necessary equipment at a time which is convenient to you. How long is the make-up session? Where will it take place? Usually, make-up and styling takes about 2 hours. Make up session can be made either in your room (in case of beach or cliff wedding) or in the special room at the ceremony venue (for example, in case of chapel or jungle wedding). How long is the photo session and video session? Photographer and videographer work 3 hours that is sufficient for usual wedding ceremony. For a small extra payment you can order additional working time (for example, shooting of the bride and groom preparations in the morning or romantic dinner in the evening). If we order video session, how long will be the cut video clip? Usually, cut romantic video clip is set to music, which can be chosen by you, and lasts from 4 to 7 minutes (see video portfolio). We are fond of photography; can we have all pictures made by the photographer in RAW format? Sure, you can. If you need initial files of photo or video sessions - just tell us in advance - but, please, remember that such data usually take much space - to record 400 RAW pictures you will need about 3 DVD discs, and to record all video materials - up to 10 DVD discs. We advise you to take the flash card of sufficient volume and give to our manager at the meeting. We don't have DVD-ROM drive at our computer. Can all photo and video materials be recorded to the flash card? Sure, it's possible. Just give the card to our manager at pre-wedding meeting. You will get it back with DVD discs. Our friend photographer lives in Bali. Can we refuse the services of your photographer and replace him/her with our? Sure, you can. No problems. Our manager will recalculate the costs without services of our photographer. We don't want to carry the dress with us - can we rent it in Bali upon arrival? Sure, you can. In our shop (and it's over 65 different wedding dresses) you can choose any dress at reasonable price - it will be prepared specially for you and delivered to the make-up session. If ordering the dinner, can we take our alcoholic drinks? It depends on the venue, where your dinner will take place. For example, VIP restaurant The Edge allows to take own alcoholic drinks only providing payment of the cork fee (about USD 50 per bottle). Without any additional expenses your own alcoholic drinks can be taken to Jimbaran Beach. In any case request such information from your manager to avoid unpleasant situations. We want to get married officially and order legal ceremony. Is it possible? Sure, it's possible and easy. We hold up to 10 official weddings every month. 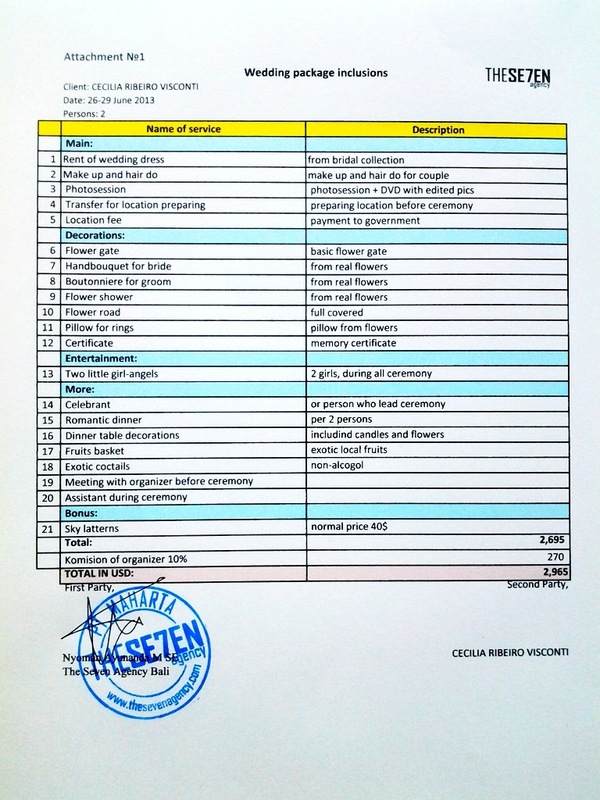 On this page we provide all details, those you need to know, if you plan to have legal ceremony in Bali. The first document is the Marriage Certificate from the local Registry Office (representatives of the Registry Office will attend your wedding). The second document is the Marriage Certificate from the chaplain (Indonesia is very religious country, and chaplain is necessary). We cannot find the Baptizm Certificate. Can the ceremony be held without it? It's impossible to hold the legal ceremony in Indonesia without it. If you don't have it - don't worry. Christian priest will perform a Baptizm (or Christening) Ceremony directly before your wedding ceremony and give you all the documents required. Shall we take the original documents required for the official registration of the marriage in Bali? and the Certificate of Baptizm. Still have questions? Send us a letter to [email protected] and we will answer within a few hours.